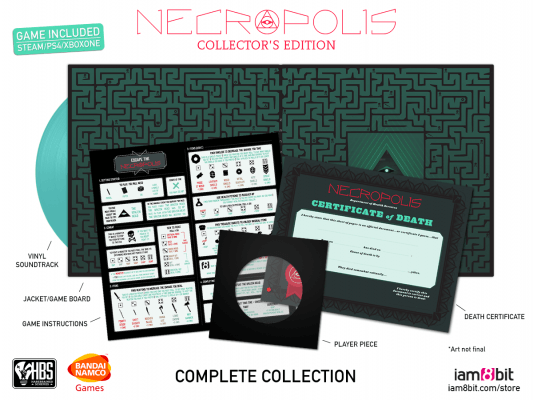 Want to have a sneak peak of the co-op Necropolis featuring famous streamers, giveaways, and soda pop? Well, you needn’t look any further than Twitch this Saturday! Zac Eubank, the host of Hyper RPG, will be hosting this incredible carnage filled event, and the video below here can give you so more details on the exact stars coming to the event. This crazy event brought to you from Hyper Rabbit Power Go, Harebrained Studios, and Bandai Namco Entertainment of America, is a 12-hour Co-Op death jam stream on Saturday, July 9th from 10 am to 10 pm PDT. 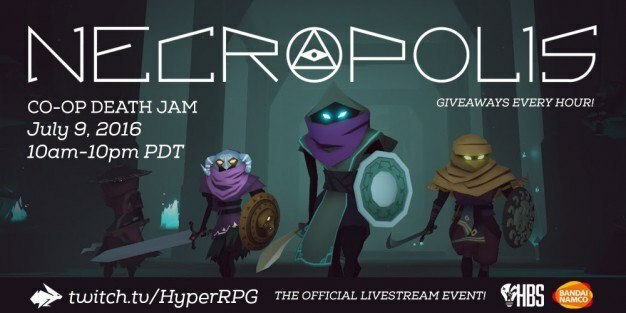 The event will be taking place in in the Hyper RPG studio in Seattle. Essentially there will be five teams of four people competing to see who can get the most kills in a two-hour time span. This will be the first reveal of Necropolis‘ co-op gameplay, the game itself will be released on the twelfth of July. So if witnessing this tournament of torture was not enough to tickle your fancy this event comes with bonus prizes for all you viewers out there. 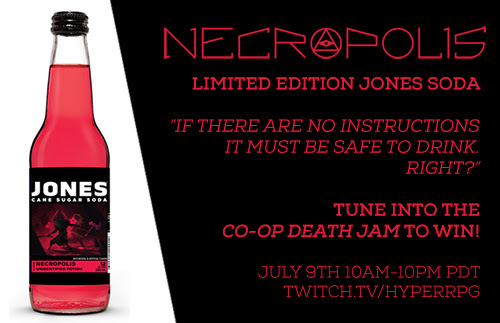 Every hour of the stream there will be giveaways for Steam codes for Necropolis, copies of the Necropolis Collectors Edition (by iam8bit) and Limited Edition “UNIDENTIFIED POTIONS” courtesy of Jones Soda. All-in-all, some absolutely sweet prizes for just tuning in to Twitch reveal!